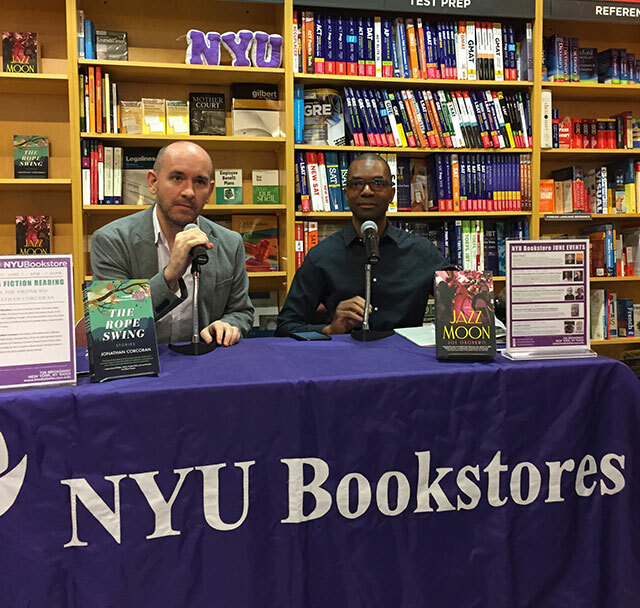 Joe Okonkwo and Jonathan Corcoran were both nominated for Lambda Literary Fiction awards. Okonkwo’s debut novel Jazz Moon is a love story set in 1920s Harlem and Paris. In Corcoran’s story collection The Rope Swing, he explores the interwoven lives of a variety of people in a small West Virginia town. Okonkwo observes that Corcoran’s stories capture a loneliness in his characters. The story collection draws on Corcoran’s experiences growing up in a small West Virginia town. The town is very isolated, and he describes driving for hours to reach the nearest airport. It feels like an alternative world, especially as a gay man, he says. Many of the people in West Virginia spend their lives trying for find their way — either to leave or to figure out how to make West Virginia work for them. He wanted to capture that concept. Okonkwo asks how much of the stories draw on memory and how much required research. Corcoran explains he relied mostly on memory and photographs. For Okonkwo, his novel is historical fiction, set a century ago and he relied on research. He found in his research a lot of information about the African American experience in that time, and a lot of information about experiences of gay men, but to be black and gay, there was very little information for him to look at. He’s always had a thing for Harlem and Paris, and long found the African American experience in those places something that has interested him. “Love is difficult. Love can be lonely,” Okonkwo says. Love and life are complicated and nothing is truly black or white. One striking element of Jazz Moon is the language and vocabulary of the era. He specifically did a lot of research into Harlemese to accurately reflect the language of the time. Hee often talks to himself as he writes and that helps add to the lyric quality of the text. One thing that he did have to confront is that his characters didn’t always have language to discuss homosexuality in the modern way. Okonkwo notes that Corcoran’s book has a political element to it. “I think its a joke to pretend writing isn’t political,” Corcoran says. He adds that what he really hoped for was that his book would get into the hands of people who could affect the lives of people in places like where he was from. Corcoran is now working on a longer novel, something he says is challenging to sustain a longer narrative. Okonkwo happens to be working on some stories, and he says these are more difficult because in a story, there is less space to express a point.